NEW FROM TOMCAT ROD CO! 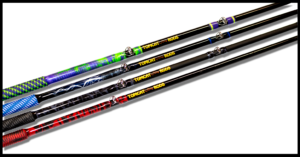 The Tomcat TC2 is a fast action rod with an unbelievablely soft tip to backbone ratio. The TC2 Medium makes for the perfect circle hook rod. With a 1-5 ounce sinker rating this rod is ideal for small rivers or slow moving rivers and lakes. The TOMCAT TC2 is almost impossible to break! Built fom the E-Glass blank up right here in the USA with an all paracord handle which is epoxied in on all sides so it cannot come undone. Allowing for phenominal grip no matter the conditions and minimal handle wear comparing to cork or EVA foam. An all aluminum double locking heavy duty reel seat and 10+1 stainless steel guides makes for one of the toughest rods out there, yet has the beauty and boldness that stand out among the rest. The sesitivty of the tip allows detection of even a panfish bite, yet the stiff backbone will horse up a 100 pound fish with ease. The TC2 M is an ideal Lake Sturgeon rod, Channel Cat rod, Striped Bass or small river Flatheads and Blue Catfish. These rods are built by hand per order. Please allow approximatly 8 weeks to recieve your order.